What little boy wouldn't want this fantastic detailed superman costume. 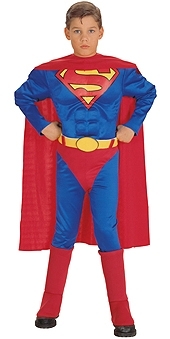 This deluxe costume comes complete with cape, moulded muscle chest jumpsuit, with attached boot tops and belt. Available in toddler, small, medium and large sizes. For details of sizing, see sizing chart. Size: Toddler - fewer than 5 available for next day dispatch.Small - Out of StockMedium - fewer than 5 available for next day dispatch.Large - fewer than 5 available for next day dispatch.